Roast the eggplants in oven for about 20 minutes until skin is shriveled and eggplants softened. Heat olive oil in a saucepan and saute mushrooms with the garlic over medium heat. Slice the eggplant and add with white wine into oil. Continue to saute for 5 minutes, stirring constantly. Add soy sauce to bring simmer. 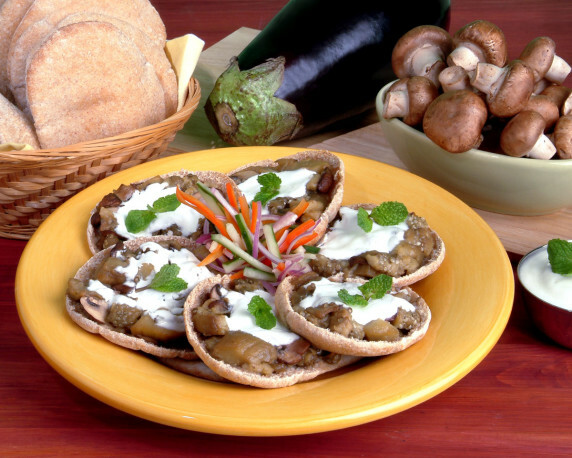 Open up pitas and top with eggplant and mushroom compote and spoon on yogurt. Toast in oven until crisp. Like an extra point after a touchdown, football and tasty snacks go hand in hand. With this year’s big game taking place in Chick-fil-A’s home town of Atlanta, why not kick your party off right by combining two fan favorites: nachos and Chick-fil-A Nuggets! This delicious appetizer is sure to be the MVP of your snack table this year – and making them is easy. What makes Chicken Tortilla Soup so good? While some mourn the close of summer, others celebrate the signs of fall: crisp weather, changing leaves, football season and our favorite: the return of Chick-fil-A’s famed Chicken Tortilla Soup.